Your trip in Boracay will never be complete without trying out the famous fruit shakes in the island. Jonah’s Fruit Shakes is a refreshing break from the sweltering heat of the sun after walking the stretch of Boracay Island. Aside from the fruit shakes, this humble restaurant also offers meals from seafood, Pinoy food such as pancit, sinigang, etc. and Mexican such as tacos, echiladas, etc. I ordered Choco Peanut while Jeff ordered Mango Banana. Price range of fruit shakes is Php 75 to Php 150 depending on the combination. The most expensive ones (Php 150) are the Strawberry shake variants. I liked the consistency of the shake because of the fine ice. Since we’re hungry from walking and exploring the islands, we also ate our early dinner here. If you’re ordering in Jonah’s, orders might take long to arrive so don’t go there with your growling stomach or you’ll die of starvation. Jeff’s Chicken Enchilada was first to arrive, since he’s hungry, I told him to eat his meal at once while I waited for my Shrimp Potato Salad. I waited for my salad for about 20-30 minutes, while Jeff already devoured his enchilada. The Chicken Enchilada was good, I know because I got to taste a spoonful of it while waiting for my salad to arrive. To sum it up, you can pass up in trying out their meals but their fruit shakes are definitely a must-try! We even went back the next day to try out a different combination, Papaya Mango and Apple Mango. Perfect equation, right? Boracay island, located in Malay, Aklan, is still one of the hottest destination during summer. With its powdery white sand and still blue crystal waters, one can never forget his/her summer spent on this island paradise. Boracay should be included on one’s “to-visit-list” before dying, its beauty should not be missed. Boracay is accessible through a 10-15 minute boat ride from Caticlan Jetty Port. You have two options to get to Caticlan Jetty Port. One is through a direct flight going to Caticlan. SEAIR, Asian Spirit, Air Philippines and Cebu Pacific travel to Caticlan daily. If you’re afraid of riding small aircrafts like me, other option is to take flights going to Kalibo. Cebu Pacific and Philippine Airlines have flight schedules going to Kalibo daily. In Kalibo, there are available Ceres Liner buses or L300 vans going to Caticlan. L300 vans charge 100 per head. One hour travel time will get you to Caticlan Jetty Port. On my previous visits to Boracay, there are 3 stations (Station 1, Station 2, and Station 3) where boats/ferries can load and unload tourists. But this time, they implemented a “one-entry one-exit policy” and required all guests going to Boracay to register. From Caticlan Jetty Port, one has to pay the environmental fee (Php 50), terminal fee (Php 50) and transportation fee (Php 19.50). Ferries/boats will dock at Cagban Port, from there, visitors will have to ride trikes or multicabs going to their hotels. Some hotels offers pick-ups at the Cagban Port. Aside from swimming, walking along its shores, food tripping and checking out stuffs at D’Mall, there are plenty of activities you can do while in the island. In the afternoon, you can get a henna tattoo or braid your hair ready for partying at night. As for us, we hired a trike for Php 450 to get us Puka Beach and Mt. 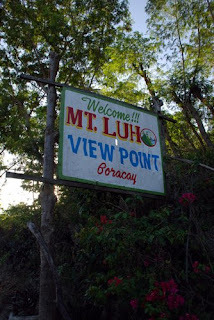 Luho, Boracay’s highest elevation. Puka Beach reminds me of Putipot Island in Zambales, it still has the powdery white sand and calm waters Boracay was known for minus the crowd. So if you want to have some peace and relaxation, then head to Puka Beach, lay your beach towels, read a book or just soak up the sun. To see the island on a different perspective, we went to Mt. Luho to see the entire island. The view from the top was breathtaking, great for picture-taking. We had a 360 degrees view of the island, a panoramic vista of the sea and the establishments in the island. The trike driver also mentioned the Bat Cave and the Crystal Cave as another tourist destination and perhaps, we’ll visit them in the future. One can never ran out of activities in the island. You can pass up the afternoon lulls by playing frisbee, beach volleyball, having a massage or by sipping your favorite shakes. Come sunset, you can avail of the Sunset Cruises (Php 499) to experience the sunset while in the ocean.